Ford has released Fiesta App on the App Store. 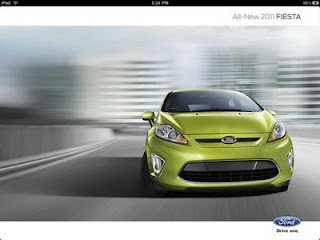 The Ford Fiesta app for the Apple iPad provides users with interactive product information, photos, videos and available custom offerings. Fiesta is the first Ford vehicle to use an app to deliver a one-of-a-kind interactive brochure experience. The now available Fiesta App for iPad offers an interactive perspective on the vehicle's 15 class-exclusive features, 40 mpg story, connectivity and accessories. One screen also details all of the available tattoos and graphics, with viewers able to scroll through to see the choices for themselves. The app also describes how the Ford Fiesta with the six-speed PowerShift automatic transmission achieves an EPA rating of 40 mpg highway, delivering class-leading fuel economy. 2011 Fiesta for iPad is available for download FREE on the App Store in the Lifestyle category. 0 comments on "Ford Fiesta iPad App released"